BlueHornet’s email-marketing platform is now part of Mapp Digital. Visit Mapp Digital’s page to view its all-in-one, comprehensive suite of software including a DMP, cross-channel marketing automation tools, and CDP. "Hard to learn, but good analytics"
The intuitive use of analytics is the easily the best feature of Blue Hornet. 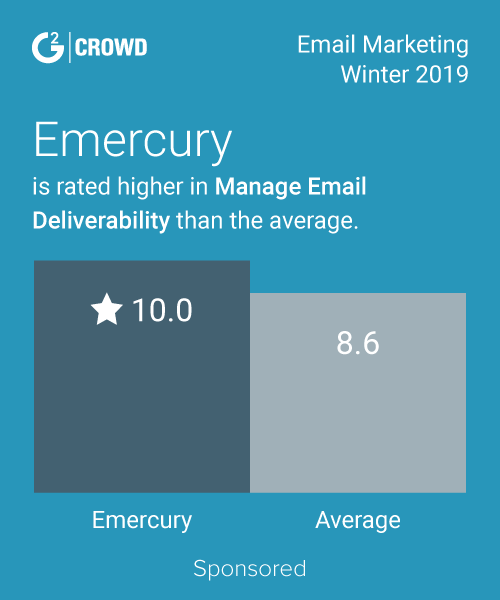 You can track performance of mass emails over time and compare trends in delivery and response. Blue Hornet does use field identifiers to make it easy to personalize your emails, but it only includes a pre-set list of fields, so you have to get creative with personalization sometimes. The process used to import emails is burdensome at best. Any file has to be imported as a CSV file and takes several steps to even get to importing a list of emails. The first several times I used Blue Hornet, I needed step by step instructions to get to this point, luckily now that I have done it for a couple years, it's easy to remember. But a first time user would struggle with the very first step of sending an email through this program. The customization fields could use some major updates as well, especially the ability to customize the fields you can include in the email. Any time I need to include a specific detail that is specific to each person, I need to assign a field that doesn't match (ex: the Address field actually fills in with an ID number). Luckily only the sender sees the code and the receiver never knows, but it does become hard to use the more personalization you include in the email. Make sure the features you really want in the long run are included with Blue Hornet, as with any other software. Our office utilizes Blue Hornet to communicate on a large scale via email blasts to prospective students. We can customize communication flow through this program to ensure that messaging is consistent across the office as well. "Exceptionally simple to use for marketing your emails"
Bluehornet is a marketing software we have been using for sending out emails and has proven to be very helpful in our office. Firstly, it is very easy to use and the most effective way the market by sending emails that we have used so far. The team has generated more sales, profits simply from using this. What I prefer more over other programs is that Bluehornet is that it is simply the easiest to use, even though a look through a manual might be needed for first time users. Overall, I find Bluehornet’s software one of the simplest to use so it is difficult to find something I dislike about it. I think that there can be updates in the overall interface. For instance, it can look more minimalistic or simpler so that it is easier on the eyes. Also, this would make me consider using this in the longer term. If others are considering to use this product, I suggest that when using Bluehornet is to have a quick look over the instructions. Then for sure this can help you effectively use the software. If others are considering to use this product, I suggest that when using Bluehornet is to have a quick over the instructions. Then for sure, this can help you effectively use the software. It helps brands stand out and reach their potential by enabling meaningful connections and lasting engagement with their customers. The cloud-based Customer Engagement Platform helps you to execute fully automated, comprehensive, multi-step and personalized marketing campaigns to drive targeted and relevant conversations across email, mobile, social and web. It recently changed names from Blue Hornet to the Mapp. It did so without notification and so I deleted a lot of emails that I thought were from the Mapp. With so many ways of reaching out to customers, multi-channel campaign management is more essential than ever. But Mapp is more than marketing technology. Their digital marketing experts have supported customers for almost two decades reaching their potential and getting the maximum value from their marketing technology investment. They help with generating leads, and strategy and consulting. Ability to link with our CMS, Abilia/NetForum. Our segments for our customers are synced into the system on a nightly basis. We also manage our Unsubscribe center through this. The system is not intuitive. The static & dynamic segments are a pain to set-up and the preferences are not great. You can only go up to a 250 mile radius of a zip code. Date functions are only greater than/less than, instead of within +/- days. Plus it's difficult to manage "not/do not include" items. Might be better off not using as an automated system and rather use it when sending emails and those who click, add to segments and launch emails from that experience. We're trying to send out automated emails. Someone who signs up would get emails within a 3, 5, 7, 10... days from signing-up. It was not an easy process to manage and still requires on-going administrative work. Blue Hornet is hungry to work with their customers and make their platform work for everyone. If you give them a use case, they find a way to help make it happen and are willing to do manual legwork on their end to help their clients meet their goals. I would have liked to have access to more reporting within their platform instead of having our account manager manually put together reports and send them over to us on a weekly basis. It wasn't exactly a hardship for us but there were times when I really wanted to look at how something was performing and my only options for reporting were to export all messages and use excel to go through. Not the worst thing because at least I had access but it could be time consuming at times. "Easy to use email marketing software"
Using Bluehornet is the best way to grow your sales using this super easy to use email marketing program. Very reliable and gets the job done better than any other similar program we have tested to date. The interface seems very outdated even though it performs updates somewhat often. Also the gather the stats or reports can be a little tricky, at least compared to doing other things we do that require reports, not email marketing specifically. We were able to generate a lot of interest in our products using this and that's really the number one goal. For promotions and other emailing items, I would definitely count on using Bluehornet to get to everyone we need to. We want to get mass emails out to those that are on our targeted list. The automation and the excellent content creation are big pluses to using it. "Intuitive, all inclusive email marketing and services platform"
They provide a robust list of features in all aspects of email marketing, including email design, subscriber registration, list management, automation, integration, reporting and analytics. BlueHornet is reliable. It has very good deliverability, strong segmentation, enterprise-level reliability, and Jeff the customer support guy is fantastic. He's worked there for a long time and really knows the ins-and-outs of the platform. The dynamic segmentation tool is well designed, much better than most other platforms that claim to have good segmentation. I also think the message creation process is fairly straightforward and intuitive. It's old, clunky, and outdated. It has not been updated hardly at all over the past 5 years and really shows it. The WYSIWYG editor is terrible, no marketing automation (beyond basic recurring messages), expensive rendering previews via ReturnPath, clunky dynamic content, very limited reporting/analytics, a dinosaur XML-based API that is slow, no pre-built integrations, and it's extremely expensive. Just give it a good test. Make sure you haven't been sold features that are terribly difficult to use. If you are a batch and blast sender, then BlueHornet might be a good fit. If you are looking for marketing automation, go elsewhere. Going back to my original comment, we use BlueHornet when we want something reliable. We've used it for 5+ years, and we know where it's lacking, but we also know that it won't go down, that the segmentation tool is very flexible, and that the deliverability is good. "A tricky program, but it looks good"
The final product - the email that is sent looks good, and I appreciate that it doesn't take that much for it to look good and send to the right person. I don't like that it is so incredibly sensitive. Whenever I use the same template, the bullets are so sensitive that I have to use Email on Acid to make sure that it will look right in everyone's inbox. Then, I often have to go to the source code to determine what went wrong. Make sure that it will suit your needs. I wish that it had better way to pull reports. It gets my email out to the people who I'm targeting. I don't know that I received many benefits beyond getting done what I need to get done. "El mejor proveedor de email"
De todos los programas que he probado, sin duda este es el mejor proveedor que conozco. Lo recomiendo a todo el mundo puesto que es uno de los mejores programas de marketing email que conozco. "Good program for sending emails"
I used BlueHornet for sending emails in prior years. I do not use BlueHornet today, but I have used it in the past. The program was good for sending emails. It was reliable and got the job done. The emails were easy to create and manage, and sending to our list of contacts was a breeze. At the time we stopped using it, we needed a more comprehensive marketing automation system, which I know BlueHornet does offer now. We used BlueHornet on a weekly basis to send marketing and promotional emails. It helped us to spread the word about our products and services, and also help drum up business. We know that the key to getting our name out there and having people talk about us is to send emails and promotions that people share with their friends, colleagues, etc. Overall the platform is easy to use and navigate through. Setting up campaigns is relatively fast and easy to do. The ability to send basic and live test is a nice feature when having to QA messages. 1) Unplanned platform outages have seemed to increase over the recent months. 2) You are not able to duplicate multiple message at one time and need to duplicate them individually. 3) When editing messages in the final review the platform will error out and make you go through each step before being able to reschedule the message. what i like best how this software is its ability to integrate the functionality of communication between various partners in the company who use the same software, this allows for a more efficient method of marketing. i am solving a faster method of communication and dissemination of information. I have realized that this product does it better than a food amount of other product services. "BlueHornet Review - It's Alright"
I really like how easy it is to use no matter how much experience you have on technology. Super nice looking also. It doesn't have some apps like Microsoft and other email providers do. They have other social media accounts that give tips and tricks so check those out. Communication problems such as statistics, etc. BlueHornet is an enterprise email service provider. BlueHornet genuine passion for digital marketing and their love of working with great brands is the best in the industry. The world's most talked-about brands partner with them for their winning track record of turning customers into raving fans. Can be very complex for new users and those who don't use this program regularly. I don't know that I received many benefits beyond getting done what I need to get done. The segmentation tools are solid, and the agency level tools are also good. Poor support for technical and delivery issues. There also wasn't support for rDNS or swapping out sending domains. Consider alternative providers that are willing to commit more of the cash flow generated from their ESP into developing new features and hiring excellent support staff. As it is, Digital River (the owning company) makes very little investment into BH. We have actually shut down our BH account and moved to another vendor. We send about 30MM emails a month and require a better level of service and support. "The intuitive use of analytics is the easily the best feature of Blue Hornet." I don't hate blue hornet per say, but its one of the most powerful yet least user friendly services out there. It's not at all user friendly which makes it difficult to use. It recently changed names from Blue Hornet to the Mapp. It did so without notification and so I deleted a lot of emails that I thought were from the Mapp. Their digital marketing experts have supported customers for decades reaching their potential and getting the maximum value from their marketing technology investment. Once we were able to get the platform up and running, as a marketer, customization within the platform was simple and didn’t require a lot of development. There was a significant amount of onboarding time to get our campaigns going and lack of support. Most of our segments were broken in fairly simple campaign structures that took weeks to work. Digital Marketing is always something our customer base will be moving to. The comprehensive scale which BlueHornet can provide is almost incomprehensible. Automated marketing campaigns are easy to turn on and off. You have to have an expert level of email coding. There are no templates like other providers. Also, analytics aren't user friendly. Automated marketing through emails based on customer actions are huge. We're only capitalizing on a few of these because it's hard to come up with them knowing the vast capabilities. They have good customer service support. The platform is antiquated. Requires a lot of back-end HTML coding. User-interface is not intuitive. Limited tracking capabilities. I like how it takes the guesswork out of a marketing campaign. There are no distinct features I didn't like. If you want to reach a customer base for any reason, this is for you. It helps you design a marketing campaign, and implements it for you. Great support also. This allowed us to come up with an email marketing campaign to let people know about a new line of products we were coming out with. BlueHornet helped me create emails for various ad campaigns in a simple manner! Marketing potential is high, this has a lot of emailing benefits. Learning curve has been a little time consuming. Marketing has improved, have has responces from using the application. The uploading mailing list options are great for successful and high impact marketing campaigns. I particularly like the HTML customization features, something that is not an option with Mailchimp. It doesn't work on Chrome. If you are using Mozilla then you are in luck and my dislike doesn't affect you at all. The option to segment mailing lists helps for effective marketing. I have solved sevral marketing problems I've had with my company. "Good but not the best..."
The software definitely gets the work done and makes things easier for the company as a whole. What I dislike about this software is how it is a little bit outdated. I don't picture myself using this software in the future. Sending mass emails was doable using this software. I liked how customizable the program was to our specific business needs. I found BlueHornet to be clunky and overly complex. We use BlueHornet to help social media advertising pushes. The benefit is that it gives greater customization options. Very User friendly, makes marketing campaigns simple and easy to analyze. The automation helps a ton! Has a learning curve. Technical support can use improvement. Email automation, daily marketing and email campaigns. Building client lists. "Used Blue Hornet for a short time"
Customer service wasn't that great. I once needed personalized help and they were not so great. The emails are great, personalized, and well crafted. "Easy to use email automation platform"
"A great tool but not for beginners"
We are no longer using blue hornet. It is very easy to use and easy to learn. * We monitor all BlueHornet reviews to prevent fraudulent reviews and keep review quality high. We do not post reviews by company employees or direct competitors. Validated reviews require the user to submit a screenshot of the product containing their user ID, in order to verify a user is an actual user of the product. Hi there! Are you looking to implement a solution like BlueHornet?